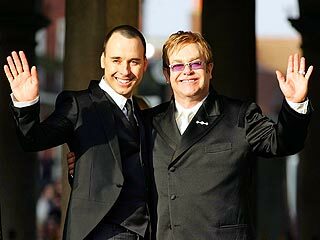 Thread: Elton John and David Furnish become parents! Elton John & David Furnish Are New Dads! It was very merry Christmas for Sir Elton John. The singer, 62, and husband David Furnish, 48, welcomed son Zachary Jackson Levon Furnish-John on Dec. 25, John's rep confirms to PEOPLE. The 7 lb., 15 oz., baby was delivered via surrogate in California. "We are overwhelmed with happiness and joy at this very special moment," the couple, who exchanged vows in a civil ceremony in 2005, said in a statement. "Zachary is healthy and doing really well, and we are very proud and happy parents." Just last year, Furish told PEOPLE they were going to wait to start a family until John was ready to come off the road. "We don't want to put the raising of children into the hands of nannies and housekeepers," said Furnish. "We want to be active parents. We have godchildren [and] kids that we support in Africa, so we're fine." Last edited by Laxmobster; December 28th, 2010 at 08:53 AM. Is a Jewish joke wrong here? What in the hell? I mean good for them but, ugh. How old is Elton anyway? well, good for them. I love Elton. congrats to David and Elton. Ugh. Isn't Elton about 64? Great. Now I can't get Levon out of my head. I wonder if that name would have been included had he not been born on Christmas. I'm assuming he was born in Bethlehem. Why did they wait until Elton was in his 60's? Why not do it sooner. He will be in his 80's when the kid graduates high school. I know. They tried before but another adoption went wrong. At least he has someone to leave all his money to. He calls his child Jesus, cause he likes the name. Yea,...lucky little baby boy!! Congrats to them. I wouldn't want a new baby at Elton's age. But he has money to hire help, if he would need it. I'd rather have my parents alive than all the money in the world. Just sayin'. By moomies in forum Who's Gay?